At CornerPost, much of what we write is intended for publications, media, technical communication and web. With a journalistic core, we turn to the AP Stylebook to guide our styling and grammar. However, there are ALWAYS exceptions, and we do bend the rules once in a while when necessary. We are not too proud to admit our imperfections. Yes, I said it, we aren’t perfect. Sometimes we just feel better coming clean with our mistakes. It is sort of our in-house therapy. That’s how we’ve put together a quick list of our 6 most common writing mistakes in hopes we might help you catch one the next time in your writing. As with most any problem we encounter at CornerPost, we also try to find the best solution for eliminating future occurrences. We’ve included some of those tips for you as well! We could spend hours discussing all the rules for capitalization, but there are a few that really make us pause in our typing and think twice about before moving on. Seasons– For some reason we like to give the four season’s capitalization power. Maybe it is because they dictate our travel, attire and day to day activities more than anything else, but they are definitely not to be capitalized. Job titles– We use job titles a lot in our writing at CornerPost, and there are capitalization rules worth reminding ourselves of. In the simplest terms, titles that are placed before the names of the persons are to be capitalized. Those that follow the name or use a comma between the name and title should be lowercase. (Capitalized) President Bob Smith gave the opening remarks. (Lowercase) Bob Smith, president of ABC Company, gave the opening remarks. A capitalization infographic with more tips. We all know how important keywords are in today’s digital world, but we’re not targeting those words that help in your SEO. The type of mistake we’re referring to is the over frequency of ordinary words in one article and, many times, in the same paragraph. This may also be happening in the first words of your sentences. We tend to write how we speak, and if you speak the same words frequently your writing may show that as well. Tip #1-One of the ways we solve this problem in our writing is by reading the first word of each sentence. How many are the same? Reformat sentences to start differently than those before or following them. Tip #2- Use a word count app that also gives you other writing specs. You’ll be amazed by what your most recent article includes when picked apart. The most comprehensive, free version we have found is Word Counter. Give it a try! Here’s another waging grammar battle. It seems each time we are typing or editing a written piece we stop to question this word. What doesn’t help our confusion is the use of both words in our everyday lives. You may enjoy a soothing Earl Grey Tea in the morning, but you also enjoy coloring with your child in the evening using a gray crayon. In researching these words further, we came to find that both words and their spellings are sometimes thought to hold different meanings, yet both originated from the same word long ago. Today, most writers establish their own rules about which spelling to use. Fortunately, there is a general rule to help ease your writing woes. In England the most commonly used spelling is ‘grey’. In America, the commonly accepted version is actually ‘gray’. How’s that for a conversation at your next tea party! As luck would have it, we can easily remember this with the differing letter referencing the first letter of the country it is most accepted in. They, this, that, those, which, it, he, she….we use them all. These are fine words to use as long as your reader understands the nouns each are referring to. This mistake brings up many haunting moments from middle school as Mrs. Gray’s sacred, red pen would repeatedly edit papers with the phrase, “Who are they?” That memory alone should be a reminder enough to keep from seeing this mistake reoccur, but as we become experts in our topic we tend to assume the reader will know what we are referencing. NEVER ASSUME! Tip #1- My best tip, if you are struggling with this issue, is to have someone edit your writing that is not as familiar with the topic or subject matter. You may be surprised by the questions they ask or the clarification they require. We value opinions, but in our journalistic and technical writing we are better off limiting the use of opinion or comparative based words. Consider a price you feel is too high. Now rephrase a statement about that price to instead state how much higher the price is than the average. Tip #1- To hinder this reoccurring offense, highlight the adverbs or adjectives in comparative or superlative forms at the end of your writing. Then review each of these to see if they describe your feelings or that of a majority. If they can be replaced with more factual phrases, particularly in technical and corporate writing, your written pieces will become a more trusted communication source by readers. I’m sure we are not the only ones who have fallen into the trap placing commas where they are not needed or not placed where they are needed. We all too commonly find ourselves typing away and placing commas where it best fits in the way we read, hear the sentence, or believe a reader should breathe or pause. While there may be a few exceptions, punctuation rules are meant to keep order. Commas are somewhat like the traffic lights of writing. They show us when to go, yield or indicate order of importance. Without comma usage rules, there would be chaos, misunderstanding and potential accidents caused by our writing. See what we mean. 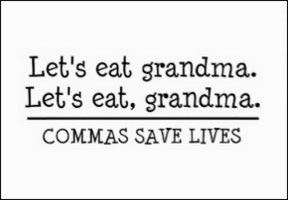 Commas save lives! Comma usage could be a series of posts, so instead we will leave you with one set of rules we commonly see confused; comma usage with nonrestrictive and restrictive elements. Example: Ben, who lives down the road, bought a new tractor. Example: Farming in the fall requires long days. Here’s another great article about the Top 10 Uses for Commas Made Simple.